That number at the bottom of the image is what I'm talking about — “127,104 people reached.” It's not that the other 60 percent just weren't using Facebook at the time. It's that Facebook limits the reach in order to sell me the attention of the page's supporters. Thing is, a reach of about 40 percent is now way above average. Page owners normally get a 2 percent organic reach, and declining. Numbers as high as 40 percent are only possible if a lot of people like and share the post (or I suppose if I pay). So if the few people that initially see what I share don't like it, then no one else gets to see. And even when a post such as the one above gets more than 4,500 likes and hundreds of shares, it's still only shown to less than half the page's supporters. Here's a more common example. 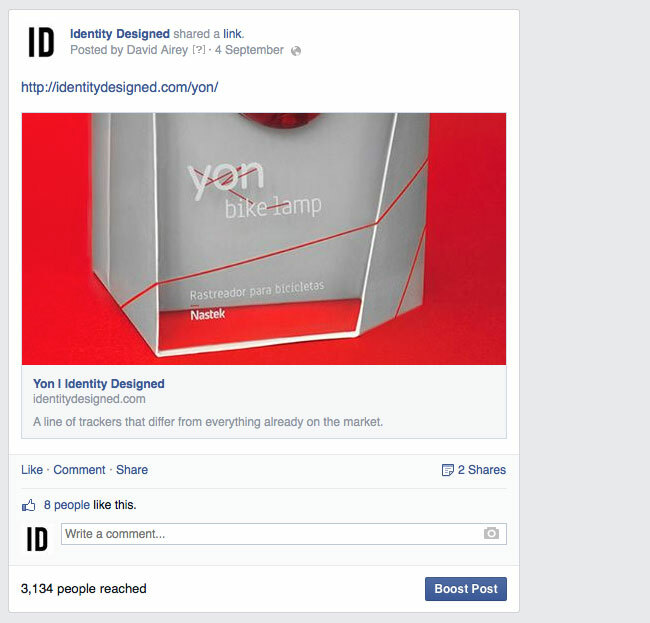 The Identity Designed page has more than 110,000 likes, yet the post below was shown in the newsfeed of just 3,134 people. So 3 percent got to see what I shared. The "Boost Post" button invites me to pay to share the post with others. But this 9-minute video (embedded below) is a good deterrent against paying Facebook for anything. “...with around 30k [likes] we were seeing some posts getting just a thousand or so views. Ergo, we were drawn to the dreaded "Boost Post." Funny thing is, it seemed to have an adverse effect on the posts that weren't boosted — we dropped down to just a few hundred views for some of them. Anyway, just something worth thinking about before spending too much time or money on your Facebook page.